This was fixed in build 16.0.8067.1000 released May 2017. Users with POP3 or IMAP accounts who created Outlook.com accounts using their own email address, to sync just their calendar and contacts have noticed a problem (bug!) after their account was migrated to the new server and opened in Outlook 2016: all replies use the Outlook.com account, not the account that downloaded the message. New messages use the correct email account but replies or forwards always show as From the Outlook.com account. At this time, the correct From account is actually used, even though it displays the wrong account. Test it, and if it sends from the wrong account, select the correct account using the From selector. Yes, it's an extra step that should not be necessary. In my tests, Outlook.com accounts with non-Microsoft addresses added as aliases and the new custom domains are affected. 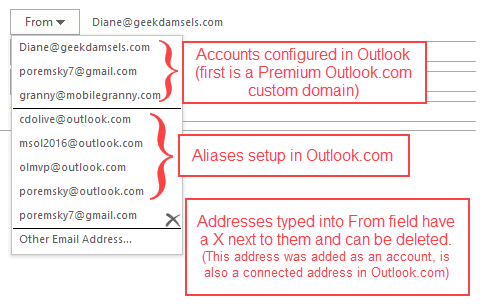 If you only have Outlook.com aliases (including Hotmail, Live, MSN), Outlook will use the correct From account. Affected users have limited options until this is fixed. You can continue to change the From address manually or remove the non-Microsoft address from the Microsoft account. Macros to change the address automatically are not working. Removing the address is not going to work for custom domains, but will work for anyone who is using a Pop3 or IMAP account and Outlook.com for calendar and contacts. The address can be added back as a connected account then set as the default for sending, which might work better. To remove an address alias from your Microsoft Account, log into your account at https://account.live.com/names/Manage then click Remove next to the addresses you want to remove. If you have more than one email account collecting email and always want to send replies using the default account, Outlook always uses the receiving account when you reply. You can select the correct sending account when you reply, but it's easy to forget to do this. This utility also fixes the Outlook.com bug where the Outlook.com account is used for all replies. Hi, I need some advice, please. Suddenly, when I reply or forward an email from my Outlook 2016, the reply email goes out from a diferent mailbox. How to fix so all my replies and forwarded will go out from the receiver address not the default one. I have about 5 mailboxes on my Outlook 2016. What type of email accounts do you have configured in Outlook? Are they all on different mail servers? One common cause is using a catchall mailbox, where each account has the same username and password - outlook downloads all of the mail in the mailbox. Thank you, Diane. There are 2 Exchange accounts, 3 IMAP (non-Microsoft) accounts. The only email account that when I hit 'reply' it won't send from the same, is one of the Exchange accounts. This one is not the default account though. It's definitely odd that the exchange account is affected. Does the rely/forward send from the default account? I just set up Outlook 2016 on a new computer, and I can't get my non-outlook.com email address to stick in the "From" list. So, now I have to select "other email address" and type in my email address every time I'm sending. On my laptop with Outlook 2016, this non-outlook.com address is at least available in the list, with an "X" by it. I can't remember how it got there though! Just happened to check back in on this... I'm not sure what has been fixed. I'm on Outlook version 1706 build 8229.2086. When I create a new email, I still see my non-outlook.com email address with an "X", and it still is not selected by default. New emails created at outlook.com work fine. What is fixed is a problem when 2 accounts were in a profile and replies to mail in the pop or imap account were sent using the outlook.com account. Sigh... yep, that's what's still not fixed for me. I'll just keep waiting I guess. Thanks for the reply! Sorry, should have said the "non-outlook address that's an alias at outlook.com" part is what is still not fixed for me. It is nice to see MS finally fixed the default send from when using an alias external account. I still have the issue of getting replays to meeting requests. They go out under ugly@outlook.com still. If I use the alias I get "meeting is not in the calendar folder for this account...". Any work around or am I missing something? The external account is an alias in Outlook.com? They are working on making this work but I don't have an ETA. Previously I was using Outlook.com for my email corresponding purpose. Recently I installed MS Office & Outlook 2016 in my PC. After setting up the same email account in MS Outlook, I found all the sent mail messages in "SENT" box (Outlook.com) could not appear in MS Outlook "SENT" box. I do not know how to solve this problem. Please help. Thank you. Did you use auto account setup to add the account to Outlook desktop? Is the folder called Sent items or just Sent? Some smartphones will put sent messages in a different folder and it causes confusion on the desktop because the messages are where you expect them to be. Yes. I did use auto account setup to add the account to MS Outlook desktop. And you are right, the folder name in Outlook.com is "Sent Items" and is different from folder name "Sent" in MS Outlook. Is this the reason why all my older sent mails in Outlook.com not appearing in MS Outlook application? I did check the syn settings in Account under Outlook.com, the syn settings is "ON" status. However, the problem still persist. Are there some ways to move all the older sent mails (in Sent Items folder) from Outlook.com to "Sent" folder in MS Outlook? Please advise. Thank you. It should be Sent Items in both outlook and outlook.com - that is the standard name for Outlook and Exchange. Press Ctrl+6 to switch to the folder list - you'll be able to see all folders in all data files. Which data file is the Sent folder in and what type of account is configured for that account in Outlook? Recently I installed MS Outlook 2016 in my PC. However, I could not retrive all the "SENT" email messages from Outlook.com to MS Outlook 2016. All the "SENT" email not appear in Sent box of MS Outlook 2016. What is the problem and how to solve it? Please help. Thanks. Some appear, some don't? Is there any pattern to which appear and which don't - like all the older ones are missing? If so, check the sync slider in File, Account settings, double click on the outlook.com account and see what the sync slider is set to. Anyone know of any updates on this? It's driving me crazy... I have my own email non-outlook.com address which I've used for years, and now since the migration I have to manually select it for every message sent from the desktop. Super annoying. No updates as far as a fix yet (although I haven't tested it with the recent insider builds) - if you set a pst as default, it will work as expected, but this will also affect the default calendar.